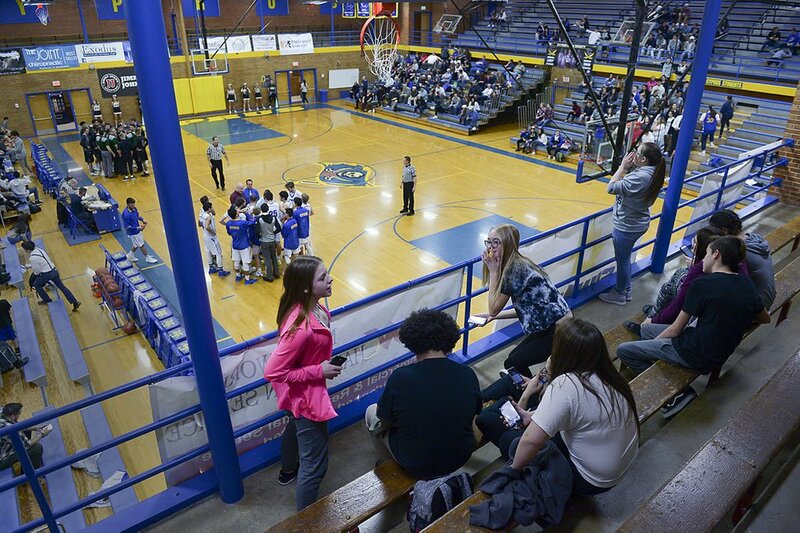 With a balcony of bleachers and scoreboards in the corners, Cyprus High has one of the last old-school gyms in Utah. But it will soon be history. 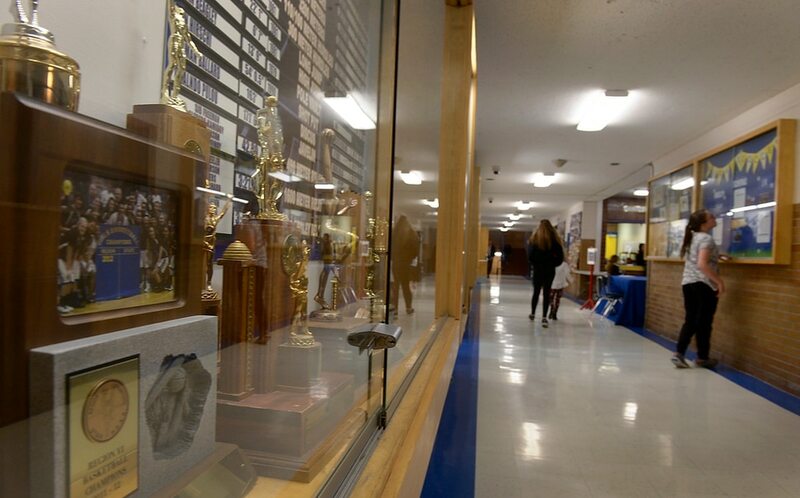 (Leah Hogsten | The Salt Lake Tribune) The trophy cases lining the halls of the high school are filled with longtime Pirate pride as Utah's oldest high school. Cyprus High School has grown and changed since the gym and what may be the state's oldest operating indoor pool were constructed in 1955. A new school is in the works, badly needed to accommodate a growing population on the west side's close-knit community, where long-time fans show up no matter how good or bad the Pirates are. 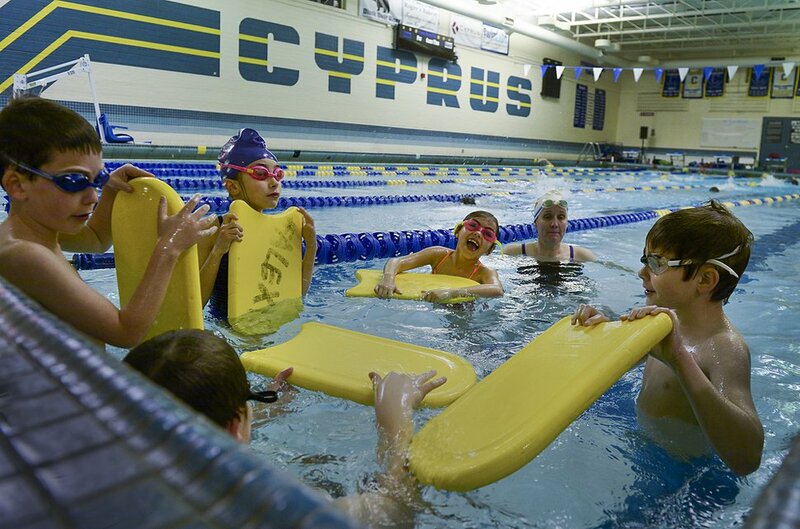 (Leah Hogsten | The Salt Lake Tribune) Cyprus High School has grown and changed since the gym and what may be the state's oldest operating indoor pool were constructed in 1955. A new school is in the works, badly needed to accommodate a growing population on the west side's close-knit community, where long-time fans show up no matter how good or bad the Pirates are. 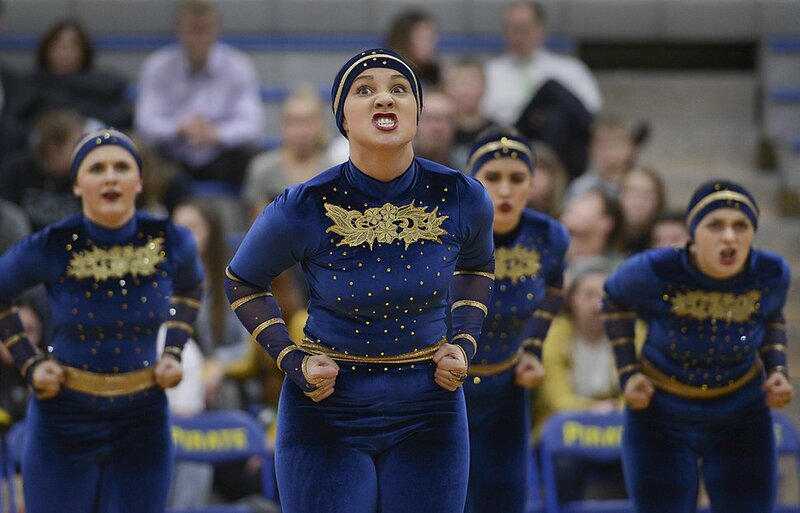 (Leah Hogsten | The Salt Lake Tribune) Brook Edwards and her fellow team members of the Spinnakers drill team, famous for using sabres in its routines, is celebrating its 50th season, performing in front of Cyprus High School boosters. Cyprus High School has grown and changed since the gym and what may be the state's oldest operating indoor pool were constructed in 1955. A new school is in the works, badly needed to accommodate a growing population on the west side's close-knit community, where long-time fans show up no matter how good or bad the Pirates are. (Leah Hogsten | The Salt Lake Tribune) Cyprus High School fans must have been thrilled when their new gym opened in 1955 and the Pirates rewarded them with a state basketball championship. Cyprus High School has grown and changed since the gym and what may be the state's oldest operating indoor pool were constructed in 1955. A new school is in the works, badly needed to accommodate a growing population on the west side's close-knit community, where long-time fans show up no matter how good or bad the Pirates are. 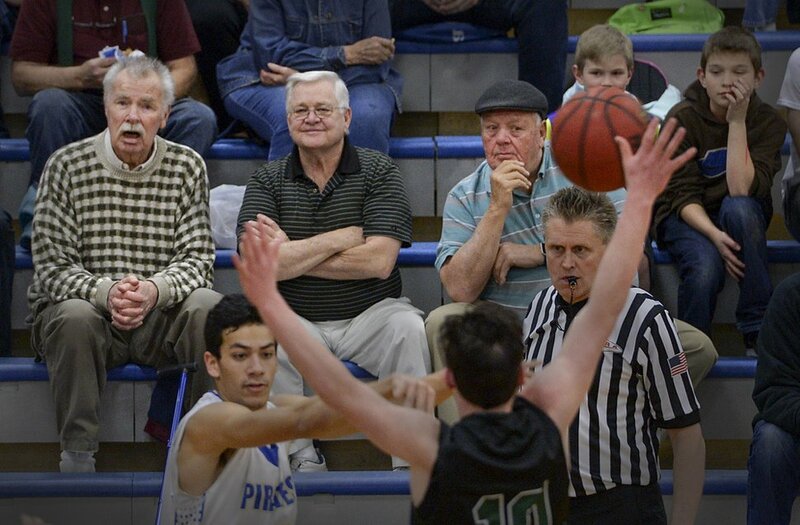 (Leah Hogsten | The Salt Lake Tribune) l-r Cyprus High School former students, coaches and boosters, Glen Rupp, Dennis Dea and Sonny Sudbury take in a basketball game. Cyprus High School has grown and changed since the gym and what may be the state's oldest operating indoor pool were constructed in 1955. A new school is in the works, badly needed to accommodate a growing population on the west side's close-knit community, where long-time fans show up no matter how good or bad the Pirates are. (Leah Hogsten | The Salt Lake Tribune) Members of the Pirate Swim Club, the oldest swim club in the state, react to the next swimming drill during practice on a Tuesday evening. Cyprus High School has grown and changed since the gym and what may be the state's oldest operating indoor pool were constructed in 1955. A new school is in the works, badly needed to accommodate a growing population on the west side's close-knit community, where long-time fans show up no matter how good or bad the Pirates are. (Leah Hogsten | The Salt Lake Tribune) Members of the Pirate Swim Club, the oldest swim club in the state, perfect their craft during practice on a Tuesday evening. Cyprus High School has grown and changed since the gym and what may be the state's oldest operating indoor pool were constructed in 1955. A new school is in the works, badly needed to accommodate a growing population on the west side's close-knit community, where long-time fans show up no matter how good or bad the Pirates are. (Leah Hogsten | The Salt Lake Tribune) Addison Meza, 10, reads a Harry Potter book atop the bleachers as her brother, Cyprus High School basketball player Cody Mesa competes during a regular season game. Cyprus High School has grown and changed since the gym and what may be the state's oldest operating indoor pool were constructed in 1955. A new school is in the works, badly needed to accommodate a growing population on the west side's close-knit community, where long-time fans show up no matter how good or bad the Pirates are. (Leah Hogsten | The Salt Lake Tribune) Members of the Pirate Swim Club, the oldest swim club in the state, perfect their craft during practice on a Tuesday evening under the tutelage of club coach Kelli Whipple, center. Cyprus High School has grown and changed since the gym and what may be the state's oldest operating indoor pool were constructed in 1955. A new school is in the works, badly needed to accommodate a growing population on the west side's close-knit community, where long-time fans show up no matter how good or bad the Pirates are. (Leah Hogsten | The Salt Lake Tribune) ÒIt has an old-school feel,Ó said basketball head Tre Smith, center, during halftime against Hillcrest High School, Tuesday, January 30, 2018. One day, I hope to have it filled before we build a new school. It is cool and weird to have once played here and now coach here. Cyprus High School has grown and changed since the gym and what may be the state's oldest operating indoor pool were constructed in 1955. A new school is in the works, badly needed to accommodate a growing population on the west side's close-knit community, where long-time fans show up no matter how good or bad the Pirates are. (Leah Hogsten | The Salt Lake Tribune) Cyprus High School's old gym is a throwback to a different era. Its floor is 10 feet shorter than most modern high school facilities. There are three rows of bleachers above the hoops and backboards. Cyprus High School has grown and changed since the gym and what may be the state's oldest operating indoor pool were constructed in 1955. A new school is in the works, badly needed to accommodate a growing population on the west side's close-knit community, where long-time fans show up no matter how good or bad the Pirates are. (Leah Hogsten | The Salt Lake Tribune) Members of the Pirate Swim Club, the oldest swim club in the state, share a laugh during practice on a Tuesday evening. Cyprus High School has grown and changed since the gym was constructed in 1955 followed by what may be the stateÕs oldest operating indoor pool, built in 1958. A new school is in the works, badly needed to accommodate a growing population on the west side's close-knit community, where long-time fans show up no matter how good or bad the Pirates are. Magna • Old, quirky high school gyms once inhabited the Salt Lake Valley. Fans filled places like Granite, Jordan, Bingham and West to the rafters, often screaming so loud that the din almost hurt. Alas, new schools and modern facilities slowly replaced the old barns. And the crowds often became smaller with students and families having many activities from which to choose. That’s not the case in Magna. Cyprus High’s teams utilize the last of the old-guard gyms, a quirky place that serves as the center of social activity for many in this close-knit community that thrived when Kennecott Copper was Utah’s largest employer. “One thing about coming to a game at Cyprus is that everybody knows somebody,” said Jackie Sudbury, who attends most of the games with her husband, John. The old gym is a throwback to a different era. Its floor is 10 feet shorter than most modern facilities. 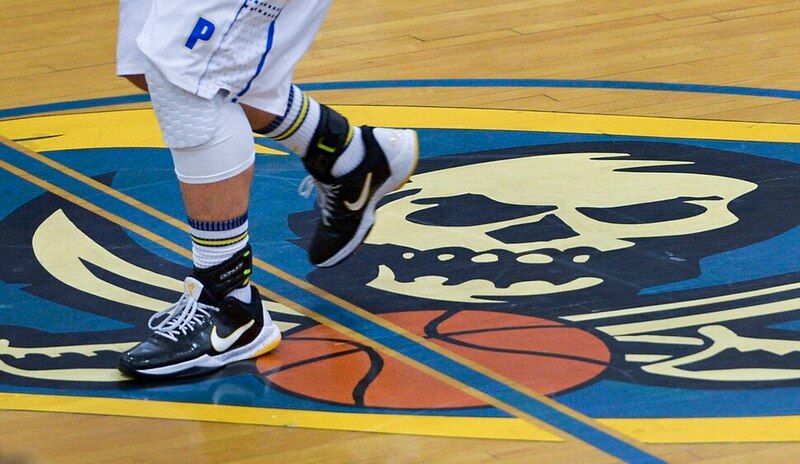 There are three rows of bleachers above the backboards, and a large painted pirate adorns the middle. Blue and yellow letters spelling CYPRUS block windows so the sun doesn’t blind a player at an inopportune time. The scoreboards, hung in opposite corners, are old school. “It was so loud that you could not hear yourself on the floor,” said Thom Mori, who graduated in 1968. (Leah Hogsten | The Salt Lake Tribune) Cyprus High School's old gym is a throwback to a different era. Its floor is 10 feet shorter than most modern high school facilities. There are three rows of bleachers above the hoops and backboards. Cyprus High School has grown and changed since the gym and what may be the state's oldest operating indoor pool were constructed in 1955. A new school is in the works, badly needed to accommodate a growing population on the west side's close-knit community, where long-time fans show up no matter how good or bad the Pirates are. The gym in some ways reminds principal Rob McDaniel of Boston’s Fenway Park with a few rows of bleachers above the Green Monster or Chicago’s Wrigley Field, where fans watch games from rooftops. “It’s different than anywhere else you could be,” he said. Eighty-seven-year-old Glen Rupp, a legendary Cyprus football coach, remembers moving the balcony bleachers forward to give physical education students a chance to box or lift weights. McDaniel, like his secretary Susan White, basketball coach Tre Smith and swimming coach Jason Hayes all graduated from Cyprus, now a sprawling campus of 2,500 students that includes the old Brockbank Junior High, a school preparing to celebrate its centennial. The school has grown and changed since the gym along with what may be the state’s oldest operating indoor pool were constructed in 1955, followed by an ice skating rink in 1958. The rink now is a weight room, wrestling gym and classroom space. The tiny pool that produced more state titles than any other Cyprus sport — 15 boys’ and three girls’ championships — is a throwback. All soon may be history. There are plans to rebuild the school in the next five years. For now, the community, staff and students continue to celebrate the heritage of Magna and Cyprus High, institutions built near the smelters of Kennecott. The Pirates might not have the state’s most successful athletic program, but Cyprus athletes are loved. Locals support their teams, whether it’s the football team playing in a stadium lit by ancient light standards located at the base of the Oquirrhs or the Field of Dreams-era baseball field built in a nearby Magna park. (Leah Hogsten | The Salt Lake Tribune) l-r Cyprus High School former students, coaches and boosters, Glen Rupp, Dennis Dea and Sonny Sudbury take in a basketball game. Cyprus High School has grown and changed since the gym and what may be the state's oldest operating indoor pool were constructed in 1955. A new school is in the works, badly needed to accommodate a growing population on the west side's close-knit community, where long-time fans show up no matter how good or bad the Pirates are. Smith, class of 2007 and a former University of Utah player, returned to try to build a successful boys’ basketball program. Mori, who still follows his alma mater’s teams, said his father built the pool and the ice rink, where teams played hockey until the wee hours of the night in a valley that once lacked such facilities. Current swim coach Jason Hayes, a protege of legendary Cyprus coach Darwin Killpack, returned to coach at his alma mater after serving in an Army intelligence unit. Hayes still holds a swim record, a fact recorded on a board of honor that hangs in the corner of the cramped facility. (Leah Hogsten | The Salt Lake Tribune) Members of the Pirate Swim Club, the oldest swim club in the state, perfect their craft during practice on a Tuesday evening under the tutelage of club coach Kelli Whipple, center. Cyprus High School has grown and changed since the gym and what may be the state's oldest operating indoor pool were constructed in 1955. A new school is in the works, badly needed to accommodate a growing population on the west side's close-knit community, where long-time fans show up no matter how good or bad the Pirates are. The tiny pool, tucked into a corner of the school, has lots of history and plenty of quirks. For example, the Pirates often have a fine water polo team, but the shallow end of the pool is just over 3 feet deep. Swimmers aren’t supposed to touch the bottom of the pool when playing water polo. That was a major problem the year Cyprus had a 6-foot-6 goalie. When exploring the halls around the gym, one of the ancient trophy cases features photos of this year’s Spinnakers drill team. The group, famous for using sabres in its routines, is celebrating its 50th season. (Leah Hogsten | The Salt Lake Tribune) Brook Edwards and her fellow team members of the Spinnakers drill team, famous for using sabres in its routines, is celebrating its 50th season, performing in front of Cyprus High School boosters. Cyprus High School has grown and changed since the gym and what may be the state's oldest operating indoor pool were constructed in 1955. A new school is in the works, badly needed to accommodate a growing population on the west side's close-knit community, where long-time fans show up no matter how good or bad the Pirates are. “Being in the state’s oldest gym and in one of the oldest drill teams brings pride to my heart,” said Brooke Edwards, a member of this year’s Spinnakers. A new school is in the works, badly needed to accommodate a growing population on the valley’s west side. Some say that growth is bringing change to the community, where longtime fans show up no matter how good or bad the Pirates are. For now, old-timers such as Sudbury head to the old gym on cold nights to bask in the warmth of the friendly confines and to chat with old friends and celebrate their favorite team.